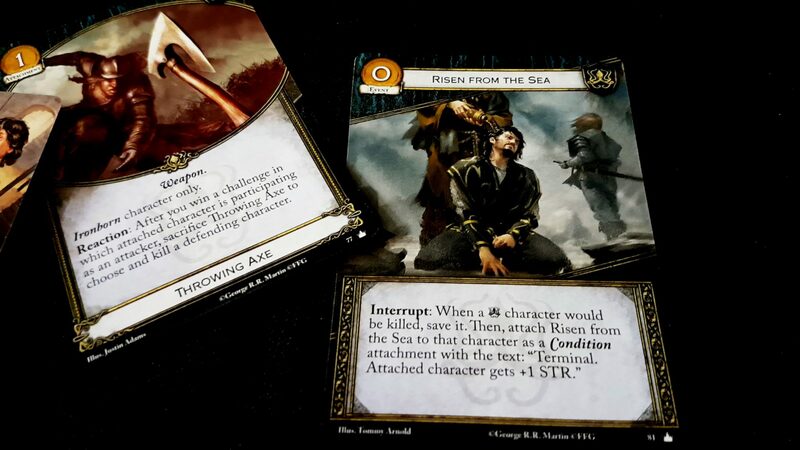 If Hand of the King was a paddling pool, the Game of Thrones card game would be a sea – a sea so big and treacherous that the Dothraki would refuse to cross it. 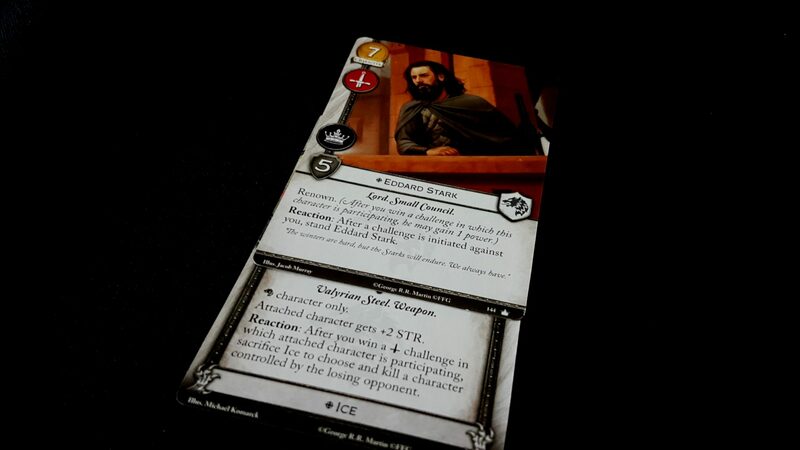 If you can learn Hand of the King in a few minutes, it sometimes takes that long to just understand how a single character is to be employed in the card game. Hand of the King is a play-fight in a sand pit. The card game is a proper Westerosi knife-fight in the car park after a heavy night’s drinking. The two games couldn’t be farther from each other in implementation, and yet they both purport to portray the shifting factional allegiances of a political landscape marked more by furtive assassination than wise governance. If you want a game you can easily learn and explain, stop reading here and go pick up Hand of the King. 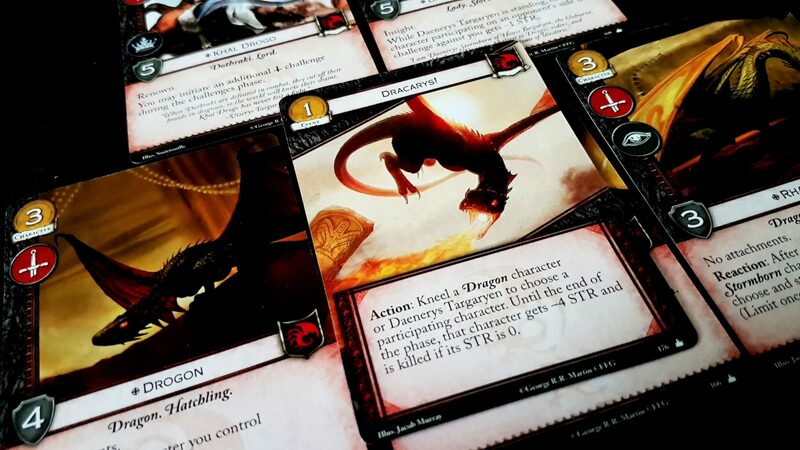 If you want a game that wriggles and writhes underneath your fingers in insistent rejection of mastery, let’s talk about the Game of Thrones card game. This isn’t the first time we’ve discussed a Nate French game on Meeple Like Us. You may remember our conflicted views on the Arkham Horror Card Game where we very much enjoyed the game but couldn’t find it in us to support its borderline exploitative business model. You might actually want to go have a read of that review before you continue here – it has some bearing on this discussion. 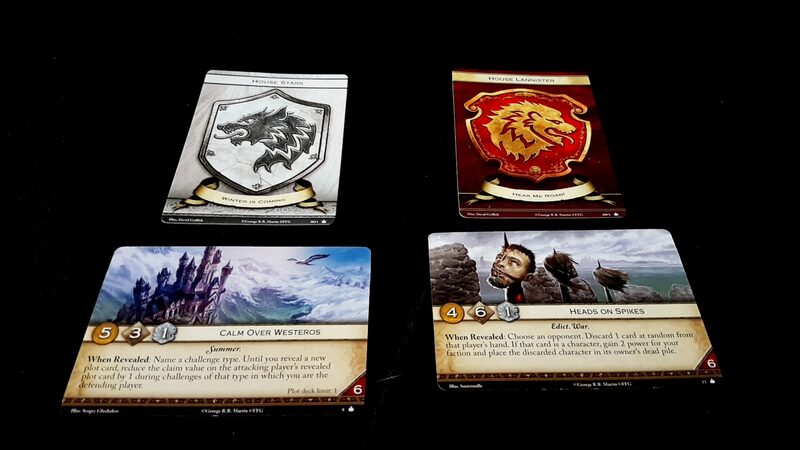 Game of Thrones is also a living card game (LCG). It’s a well-established title and as such there is a regular cycle of expansion content that at this point creates a pile of boxes large enough to keep Wildlings out of the south. Within the core set – for with Fantasy Flight it is always a ‘core set’ – you get enough content to enjoy a taster of the game but deeper investment in its intricacies is going to need you to pony up. Current thinking seems to be that two sets are the minimum needed to engage in meaningful deckbuilding, and three are better because of the way card duplication works. I only own a single core set, so I can’t offer a meaningful view there. 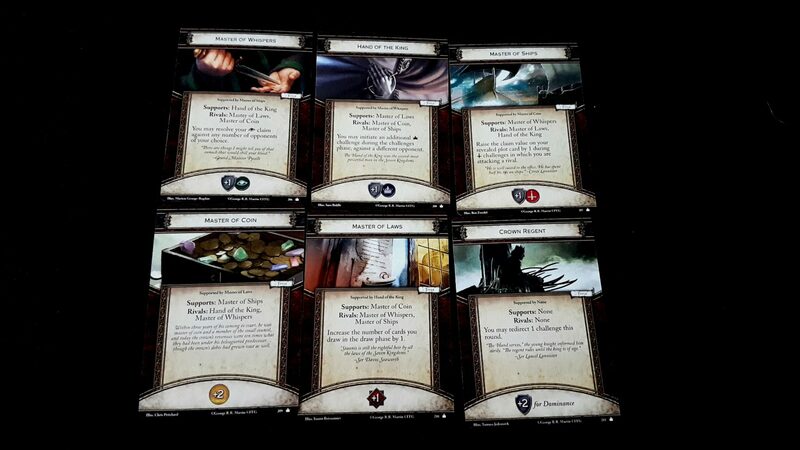 What I will say is that whereas the Arkham Horror game feels stingy in its offering I couldn’t be happier really with how much I got in the GoT core set. It makes me feel positively hoggish – again, provided you’re happy with limited deck building opportunities. 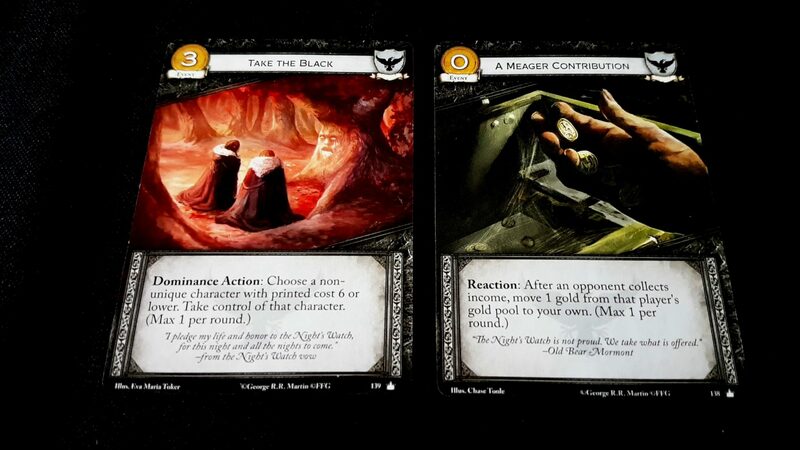 That picture above shows what you get with the Game of Thrones core set – four meaty faction decks that represent some of the fragile allegiances that were in play in the early phases of the books. 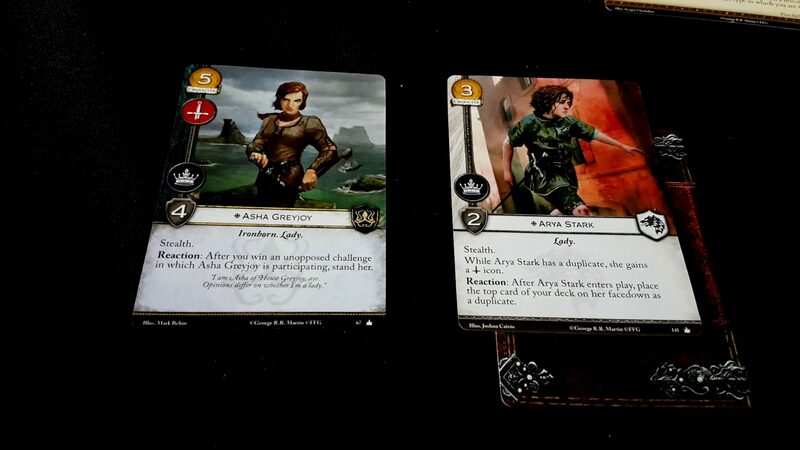 The Starks and the Greyjoys, unified by the consensual kidnapping of Theon, form a faction deck that combines the underhanded deviousness of the Ironborn with the strength and resilience of the Kings in the North. 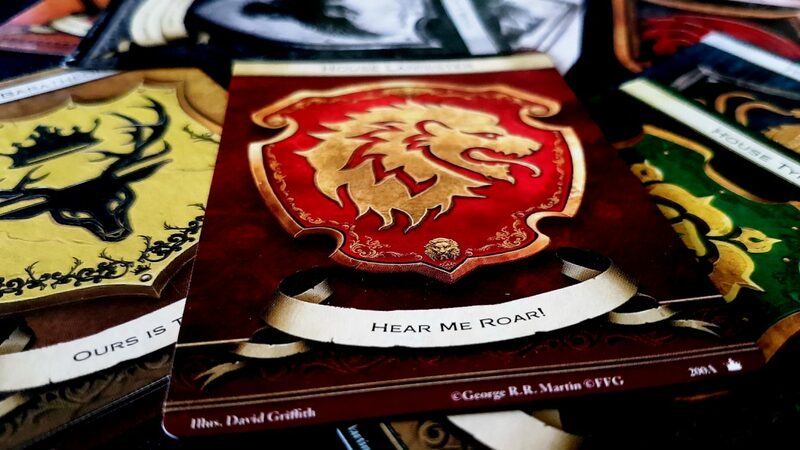 The Lannister deck marries the wealth and intrigue of Casterly Rock with the versatility of the Rose and the Thorn. The Night’s Watch, under the benevolent gaze of the Baratheons, focus on the defensive gifts of Castle Black and the political dominance of the Iron Throne. The Targaryens have the might of the dragons and the Dothraki, along with the responsiveness and soft power of the Martells. Each deck requires a different approach and offers different strategies and synergies, and as such you’ll spend a lot of time simply learning a deck before you can play it effectively. There is a lot of game in the core set, and none of it needs you to invest farther in the business model than you’re prepared to go. With Arkham Horror if you wanted to explore the story you needed to dig out the wallet. The mechanisms remained as solid as ever on repeat plays, but the novelty and mystery of the narrative melted away under sustained attention. That’s not in itself a major weakness except that Lovecraft is a franchise that finds its most coherent expression in the unknown. As such you were almost mandated in my view to keep on keeping on. Game of Thrones is all mechanisms – what story telling exists in the game is incidental at best. As such, if you’re happy with the way the game plays there’s nothing that compels you forward. If you want to buy more here it’ll be because you want to rather than because you feel manipulated into additional acquisitions. That’s much easier for me to endorse. The Living Card Game model, in and of itself, is not necessarily a problem – like almost anything, it’s in how it’s applied. It’s applied well here. 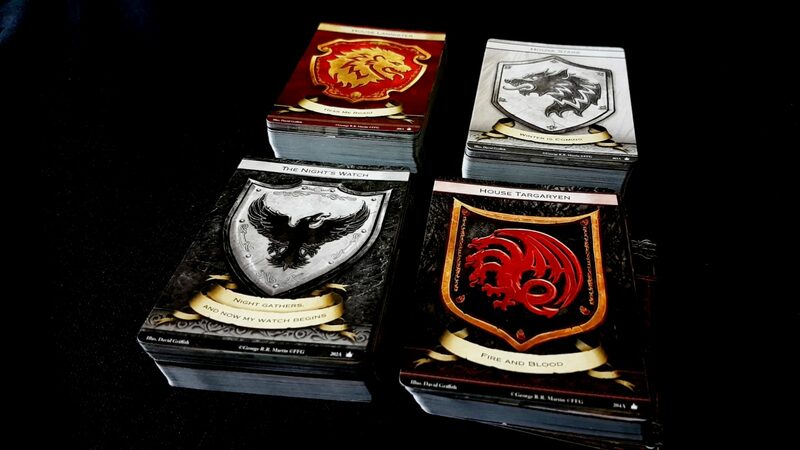 The Game of Thrones Card Game can be a lifestyle game, or it can be just what you get in the box. Either will be fun. Burn them all. Burn them all. BURN THEM ALL. These decks that you pick up are comprised of seven plot cards and a whole pile of game cards in several different classifications. You’ll find the characters of the novels in there. You’ll find the locations. You’ll find the various weapons and potions of legend, and the events of infamy. Your job is to marshal a force of these into something irresistible in order to claim the fifteen symbols of power that determine you’ve won the game. I won’t go very deeply into mechanisms here, because like any LCG this is marked primarily by card synergy and deck composition. Suffice to say this is a game that is complex and complicated. By the time you’re a couple of rounds into a play session you’ll be facing a game state that you need to approach like an unexploded bomb – one wrong move and the whole thing could explode. Fundamentally the rules are quite simple, but each new card adds a new wire to the ticking mechanism that has a mysterious effect on the regulatory systems keeping the detonation at bay. You wouldn’t expect the job of disarming such a thing to fall to the work experience kid, and so it is here. You need to understand the internal systems before you can hope to tug at the right wires. During the setup phase you’ll grab your deck, configure it, and play out eight coins worth of characters, attachment and locations to your play area. Then you’ll enter the game proper. Each player will secretly pick one of the plots in their deck, simultaneously reveal it, and resolve any effects. The plots are large scale macro-events that have a significant impact on the momentum of play. They determine your economy, your initiative, the power of your actions and the number of cards you get to keep in your deck at the end of the round. They also usually have some special effect that influences individual players, or perhaps every player at the table. You’re going to use each plot in your deck once before you get to cycle them back into your hand and so you want to make sure they’re played wisely. Unfortunately since you’re all choosing in secret you can’t just focus on what works for you – you need to be wary of what an opponent might be doing, and what they might be doing in response to what they think you are doing. 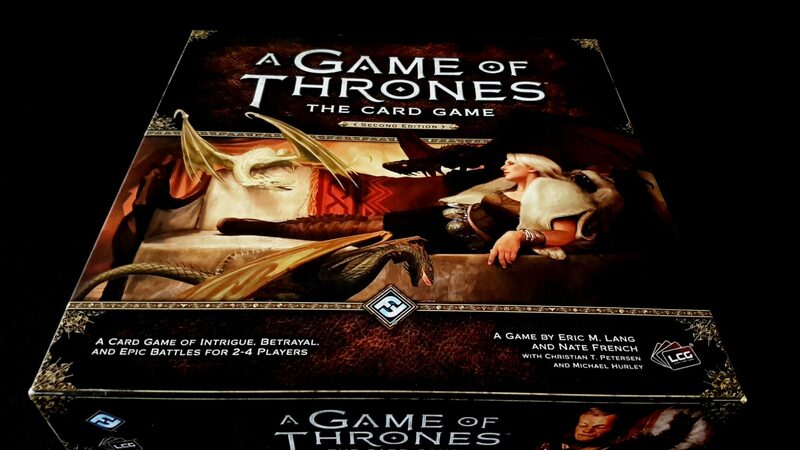 As you might imagine, this leads to the first significant issue of Game of Thrones – it doesn’t play well at mismatched levels of skill, but especially not in mismatched levels of deck familiarity. To know the plots that work best for me I need to know the plots that you have that work best for you. I need to know how those plots interact with your deck, and how my characters interact with your deck. The Starks have a plot that forces everyone to abandon the money in their treasury after the early stages of the round – that’s tremendously powerful against the Lannisters especially when Tywin is in play, but considerably less so against Targaryeans. 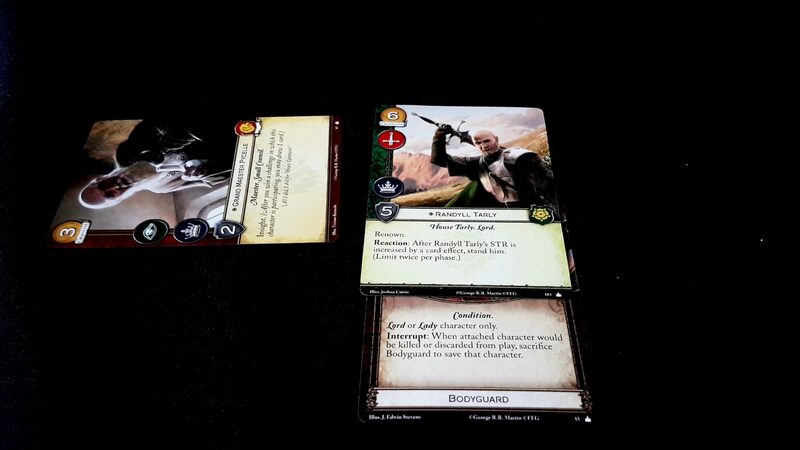 The Lannisters in turn can behead characters that have yet to be played into the battle – that works well against a character heavy deck but is practically useless against a hand that contains few characters of note. Well – that’s not a card I wanted to discard. That which is dead may never die. Your plot could be devastating. It could be useless. It all depends on how well you know how the decks work, and how the luck of the draw has gone. Game of Thrones respects mastery, and in doing so it presents an almost impenetrable puzzle for novices. Once you’ve played your plots, you all collect your money, determine action order, and then marshal your cards. 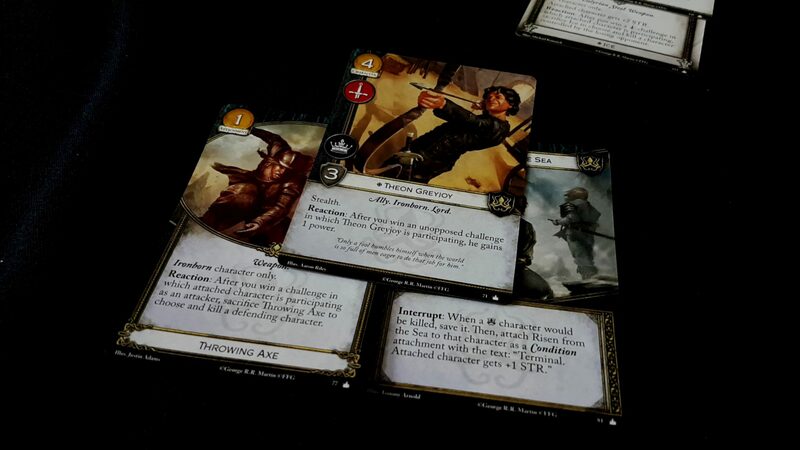 You spend money to bring new cards into play, and perhaps hold some back for carrying out events and ambushes during the course of the round to follow. In turn order, players choose to initiate challenges, each of different types, against their opponents. 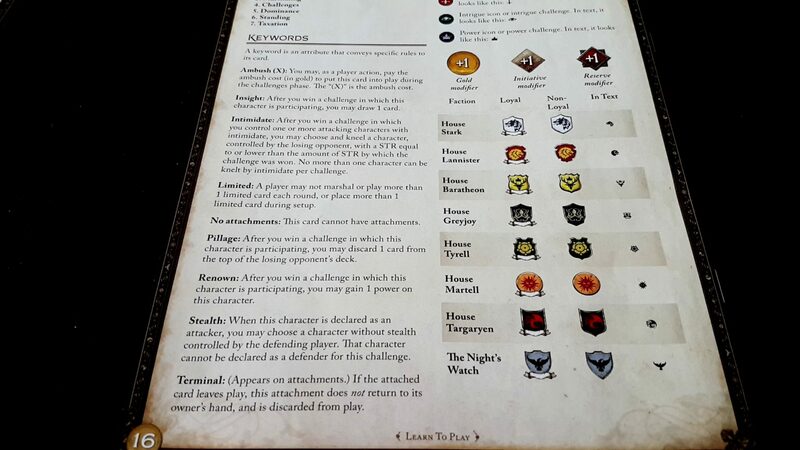 Each of your characters has a number of icons represented showing whether they’re capable of taking part in military, intrigue or power challenges. Military challenges, when lost, force you to kill a character of your choice currently in your play area. Intrigue challenges rob you of cards from your hand. Power challenges let the aggressor take a power token from your faction and move it over to theirs. The consequences might be trivial, or they might be too costly to even contemplate. If you are the aggressor and lose a challenge it does nothing – the cost of defeat is always borne by the defender. These icons are sometimes malleable – changing as cards and attachments and locations are played. 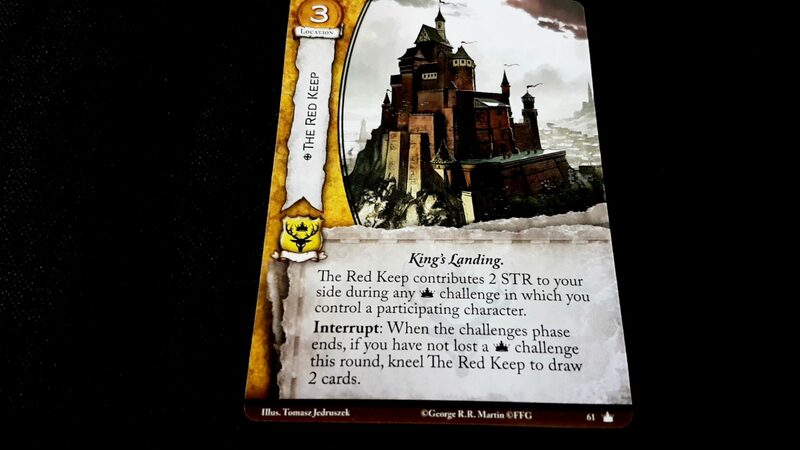 Some other cards alter the number and type of challenges that may be performed – whoever controls Casterly Rock gets to initiate an additional intrigue challenge, for example. However, characters can only participate in a single challenge before they have to kneel, except sometimes that’s not true either. Kneeling characters are no longer available for attack or defence, and as such every character in your play area is a resource you need to consider carefully before spending. To be fair, Pycell is an old man and needs to kneel. Managing these contests and the order in which they are carried out is a key task of the game, but mostly what you’re looking to do is manage the availability of characters by utilising their various special powers. Fundamentally, the Game of Thrones card game is a series of poker challenges where you’re attempting to raise the ante high enough to cause your opponents to cry off of the encounter. An unopposed challenge automatically succeeds, and it gains the attacker a free point of power as a reward for your cowardice. As such, everyone is incentivised towards participation at the very least, although… well, we’ll get to that. To challenge you choose a number of characters with a matching icon, sum up their strength, and then let your target pick what defenders they wish to rally in opposition. On its surface this is purely an exercise of arithmetic, but playing that way will all but guarantee your defeat. 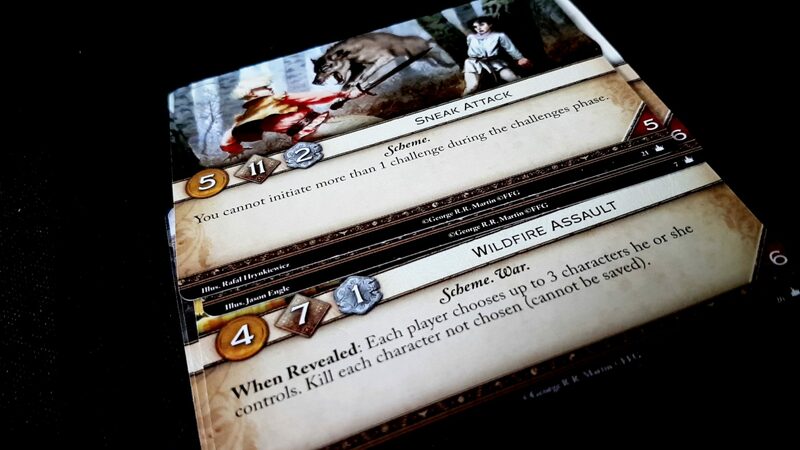 Characters allocated to defence must kneel, and as such you may simply not want to waste them on a weak challenge or simply have a better plan for them during your turn. At the end of each round too the player with the greatest remaining strength wins the dominance phase and gets a point of power for their prudence. As such, sometimes you’re considering future rewards versus immediate harm. That always has to be viewed through a lens of what the challenge means for the larger context of the game. Consider Asha for example – she has a reaction ability that allows her to stand again in an unopposed challenge. Maybe you want to feint with a military challenge with Arya so as to force your opponent to commit Randall Tarly in defence. If that’s the only standing character available, Asha could then trigger a power challenge, win it unopposed, stand and then claim dominance for the Starks. This is the kind of decision you’re looking to make with every challenge in Game of Thrones, and you need to be considering these decisions in relation to what your opponent can do. … that is, if you think the other player is going to sacrifice Ice. I mean, that’s a +2 STR on every check. It’s not an easy decision to give that up, especially if its mere presence has a powerful propagandic effect on play. Perhaps it’s a bluff. Perhaps it’s a feint. Perhaps it’s an honest attempt at a beheading. Having said that, Ned isn’t known for his grasp on the subtler side of power politics so maybe best assume the man that passes the sentence is intending to swing the sword. 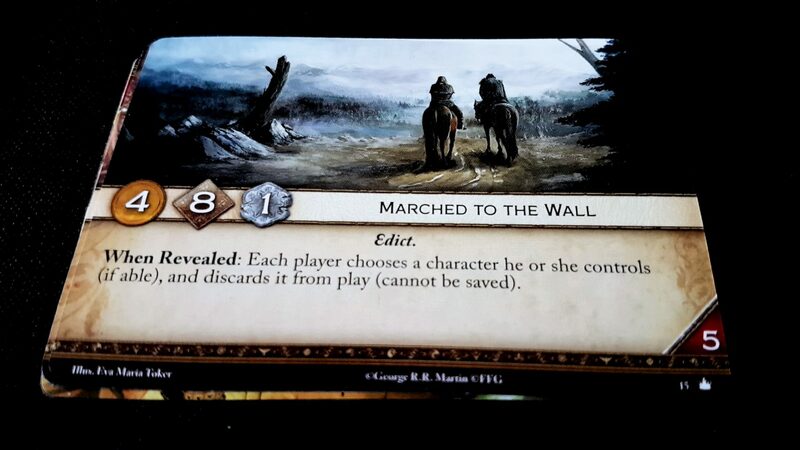 Or what if Theon is in play? What if he’s ‘died’ once and is now ‘risen from the sea’. What if he’s got a throwing axe attached to his belt. Look at what that throwing axe does – like Ice, if you win a challenge you get to sacrifice it to kill a character that was part of the defence. Theon isn’t a particularly tough character, even with Risen from the Sea. Maybe you’ll just let the attack go through unopposed so that you kill a character on your terms rather than his. But his power is also if he’s unopposed in a challenge, he gets an extra power token of his own. An unopposed power challenge from Theon, in these circumstances, nets your opponent three power and that’s 20% of what they need to win. So maybe best to defend with some arrow fodder, if you have some? But in that case you’d need two arrow fodder characters to really be able to bear the brunt of the attack. Or perhaps Balon Greyjoy has the Seal of the Hand – that lets you use Balon twice in a round, and he’s not only powerful in his own right he only treats with equals in a challenge. You can see I’m sure why the simple model of challenges actually becomes intensely complicated as the game goes on – it’s not the numbers you need to consider, it’s the powers behind those numbers and how they interact and intersect across the entire game. Sometimes too you have tools and tricks that can help reduce the danger presented by particularly lethal characters in play, and that in turn has an impact on your decisions. The situation is further modified by the many locations you can play out to your area – these alter costs of actions, of characters, and of the game economy. The roseroad gives you an extra gold coin every turn. The King’s Road gives you another point of initiative and you can choose to sacrifice it to reduce the cost of your next character by three. Some cards are situationally useful. Others are so incredibly powerful as to be intensely distorting to the game. Not to mention their plot card that forces an opponent to discard a character from play – that’s especially vexing if you put all your resources into one especially powerful character that has hitherto dominated the game. When you’re facing an opponent with these kinds of cards, obviously the solution is breadth rather than depth. You want to have lots of characters that you won’t weep to lose. Except… no. That also isn’t going to exactly work because you never know when some sociopath is going to rain wildfire down onto everyone in the game, including themselves. It’s not even as simple as knowing an opponent can do that – it’s knowing when they’re going to do it and that’s as much about their cards as it is about yours. But even if you’re not wary of wildfire, you should be wary of when the shifting loyalties of Varys might make themselves known. 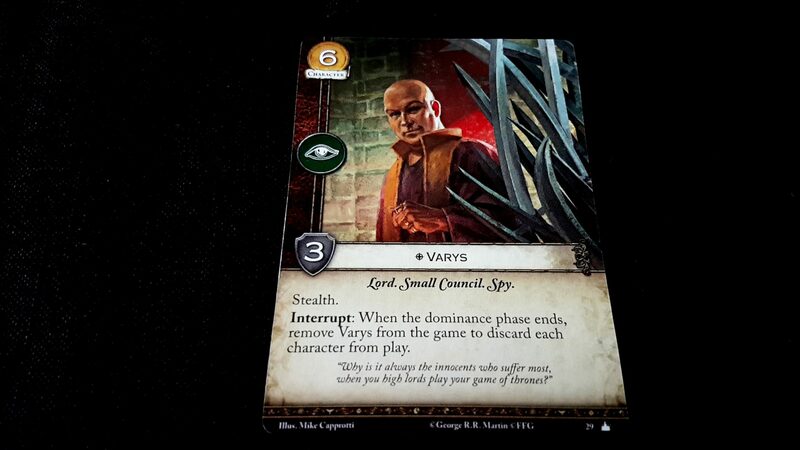 Varys is a card that is in many places during the game, befitting the activities of the man himself. He might manifest in the service of the Starks, or the Lannisters, or both at the same time. At any point though at the end of the dominance phase he gets to trigger a hard reset on the game and the only time he’s going to do it is when his player thinks that’s the best way to even the odds. It’s like a dead man’s switch – its mere presence means you need to be more tentative in every situation you face. Seven hells, there is so much going on in every session of this that you could play it for days and still be encountering new situations. The game rewards changing your preferred decks as you play but it equally rewards mastering a single deck. The battle of the Starks versus the Lannisters is different from the one between the Starks and the Night’s Watch. You need to adapt your tactics to the strengths and weaknesses of your opponents. A wise high lord could learn a lot from Sun Bin in this – race their fastest horses against your slowest, your fastest against their middling, and your middling against their weakest. A wiser lord would question whether it is necessary to take part in the race at all. What makes all of this so interesting is the elasticity in the dynamics. Perhaps you should concede a power challenge on their turn to make sure that you win the military challenge on yours. Or perhaps you’ll do it to make sure they actually have a power token to steal when you make your play. I’ve complained in a number of reviews about games that force you to say ‘Actually, I guess I’ll do nothing’ during your turn. Game of Thrones is one of those rare games that makes that decision satisfying. It’s the subtle difference between not participating and choosing not to participate – and that choice is as much about what gets sent against you as it is about what you have available to commit to the challenge. Maybe you could very much win that intrigue challenge that you’ve got available, but if any opponent has Tyrion Lannister in their play area they’ll get two gold for your efforts. 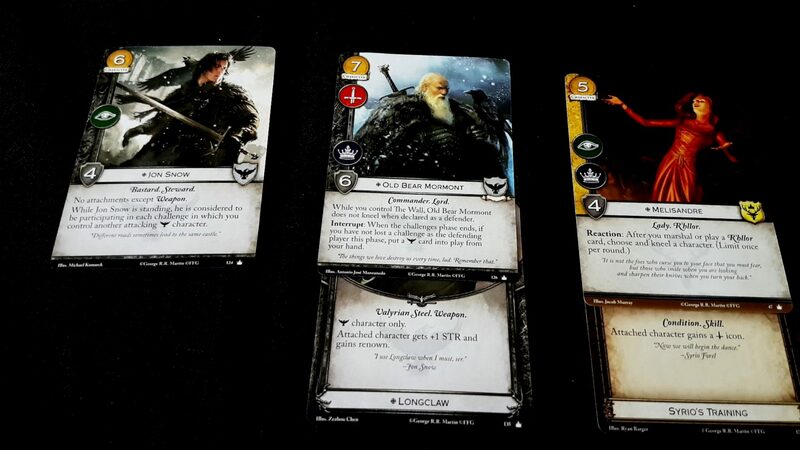 Maybe you want to go kill Jeoh Mormont to get him out of the way, but if Joffrey is in play he gains a power token any time any Lord or Lady character is killed. Just imagine that – other houses at the table that get paid tribute for all the hard work you put in. The mere presence of certain characters in play changes the dynamics of the game around them. Some characters participate in all challenges without you having to kneel them, others contribute even when kneeling. Some cards gain power the longer the game has been going, others permit you to cycle through your hand more efficiently. You’ll eventually develop the strategies and synergies that let you get the best out of a faction, but you’re going to have to commit to the task because all of these systems are intensely interlinked and you’re going to have to build all of those links yourself. Stannis is the best of the five kings because he knows the difference between less and fewer. If I was going to sink myself into mastering an LCG, there’s a real chance it would be this one – the theme is woven all the way through it, and while it’s not a particularly strong game from a narrative perspective the mechanisms are rock solid. I can’t help but marvel at how clever some of these systems are. 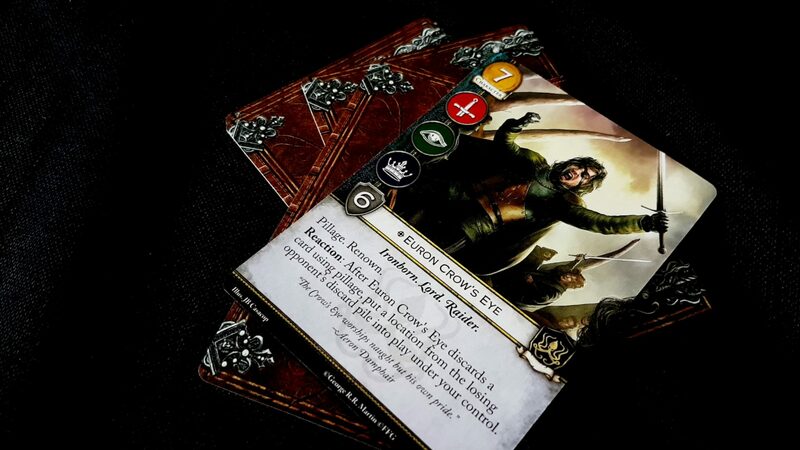 You don’t even particularly need to be a Game of Thrones fan to enjoy it, although if you are there are occasional beautiful touches in the card mechanics that will raise a joyful smile. 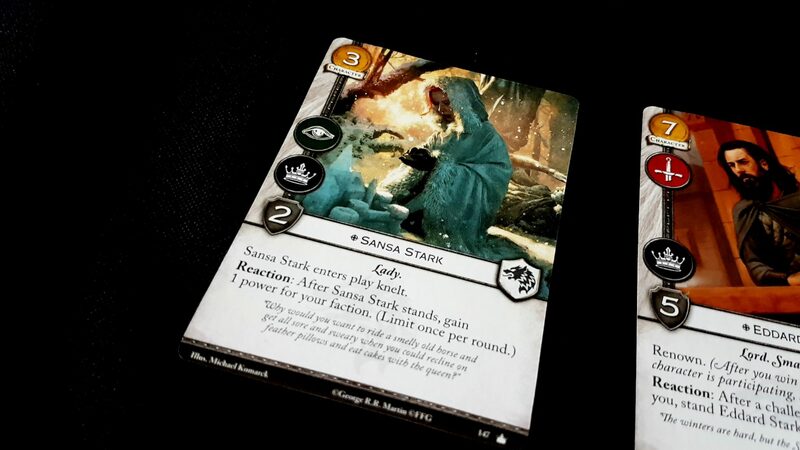 I’m particularly fond of the Sansa card which is about as perfect a representation of her role as I could imagine. The problem is the same as is always going to be true for an LCG though – I can’t really justify the time I need to sink into it to become genuinely good. That’s because it’s a game that pretty much demands players of equal skill sitting across from each other. As with Hive, this is a game that requires players to build explicit mastery and it’s not a lot of fun to play in mismatched settings. Unlike the Arkham Horror Card Game, this is a game of outright competition. You can’t just play solo and you can’t rely on the collaborative mechanisms to compensate for skill mismatch. That requirement for dedication is further complicated by the fact that occasionally you end up in a situation where the cards just aren’t cycling the way you need them to and your opponent is completely locking down everything you can do as a result. If you don’t draw a military presence in the setup, there’s not much you can do to whittle down an opponent’s forces. If they have plenty of military you’ll find yourself unable to really find a path out of your discomfort. Many cards are useful only in the context of having a complete set of money, the initiative, and freedom from consequence. There’s not a lot of point playing down your seven-gold superhero if he’s just going to be instantly cut down by a wildling army supported by dragons. In a well-matched game the momentum of power will swing and pivot. In a poorly matched game, or a game defined by poor card draws, it just accumulates in the luckier players until you are completely blocked out of participation. Some challenges are definitely more powerful than others unless sufficiently supported by the engine you have constructed. It’s not enough to have good characters, it’s important to have them in the right categories with the right supporting cards. There are many frustrations that come in even attempting to build the necessary mastery. It’s hard, from a pedagogic perspective, to disentangle the root causes of a poor result. It could be in your playing, it could be in the randomness of the deck, and it could be in the fundamental composition of the deck itself. It’s going to be some blend of all three of those things, but the key thing about getting good at something is that you need to be able to focus on those elements of the task that are within your sphere of mastery. If you can’t even tell for sure from where poor performance derives, even the simple act of getting better can be deeply demotivating. And again we come back to the same observation made at the start of the review – I think this core set is good value and generous in what it gives provided you don’t want to do any real deck building. If you just want to battle the decks as they are outlined in the manual, you won’t begrudge what you get. Part of the joy in a game like this though is being able to carefully tend and cultivate a deck so that it contains secrets and traps and schemes and dreams. The act of building a good deck is a very real and fundamental part of the game for many players. You’ll need at least one and probably two more copies of the core set to do that, and that’s before you start exploring the massive icy expanses of the expansion landscape. 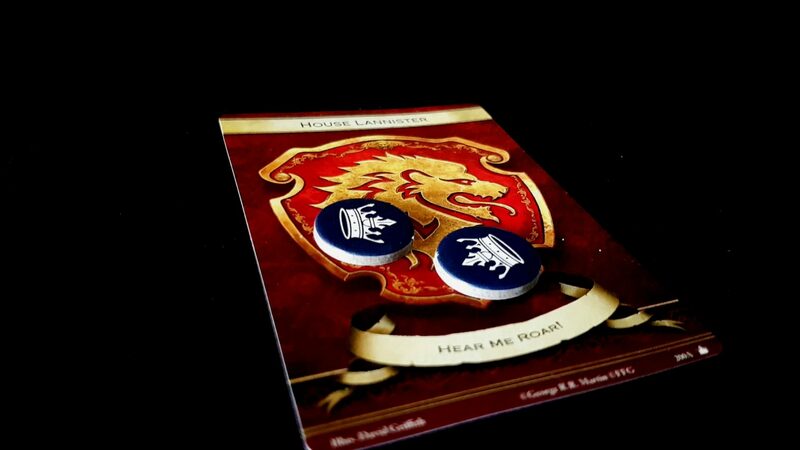 That in turn opens up a very different game as you are no longer dealing with house alliances but rather houses that are tightly tuned to their own individual strengths and weaknesses. 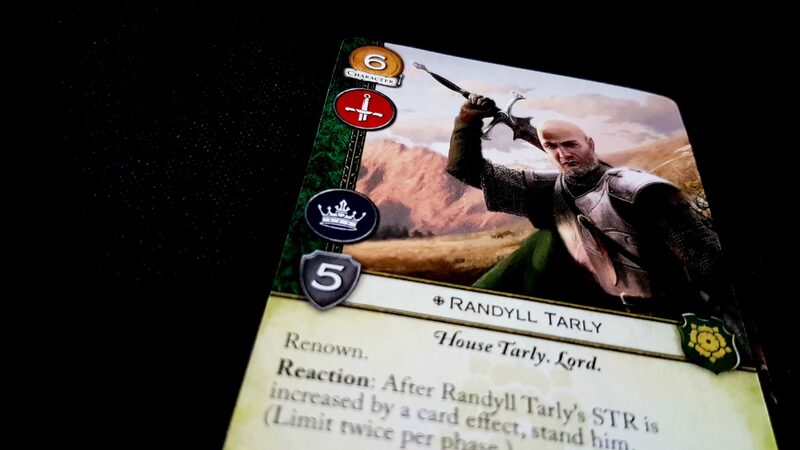 The core set of Game of Thrones creates game decks that are more generalist than the individual house decks would be, and that again is an additional issue of complexity you need to take into account when considering what developing mastery involves. Me, I don’t think I’ll be investing any more time into genuinely mastering Game of Thrones just because I don’t have room for an LCG in my life. That’s something that’s individual to me though – a specific intersection of interests and life responsibilities. if you’re not in that same situation I think you’ll find a game in this box that could consume your life if you were prepared to let it. When you play the game of the Game of Thrones, you win then you buy. And then you keep on buying. Forever. ← How do we make accessibility sexier?